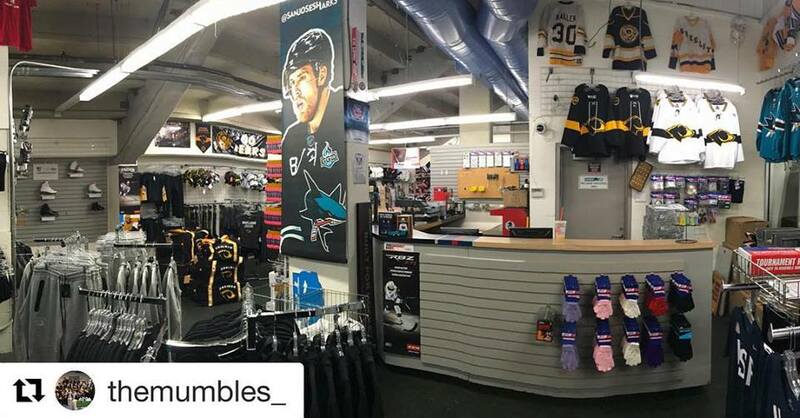 While you’re at Sharks Ice at San Jose, Fremont or Oakland stop by our full service Pro Shop. You’ll find a wide variety of beginner to advanced level figure skating and hockey equipment in addition to clothing and the hottest Sharks paraphernalia. Take advantage of services including jersey numbering/lettering, skate-sharpening, mounting, and equipment repair. BROKEN STICKS: Sharks Ice is not responsible for broken sticks or replacement blades. Customer must access the manufacturer’s website and follow their policies as to warranties and replacements. We DO NOT replace broken sticks or blades. Sharks Ice at San Jose has the new revolutionary designed skate sharpener. It contains a variable speed spindle that maintains constant surface feet per minute for optimum grinding action. The new front feed system with integrated linear bearings along with the granite top for accuracy and durability makes this machine perform a precision skate sharpening. With this state of the art machine, Sharks Ice will continue to offer sharpening at the same low prices we always have, $7 for Hockey Skates, $9 for Figure Skates. First time sharpening with in house skate purchase is FREE. First time sharpening for non-in house skate purchase is $15. Hockey is a fast pace, high intensity sport, fueled by passion for the game. At Sharks Ice we stress the importance of a safe and healthy learning environment and the need to protect oneself. We offer a full-line of the latest player and goaltending equipment, including a great selection of NHL jerseys & apparel, skate sharpening services, and more. Additionally, our Introductory Hockey Equipment Packages make it easy for new youth players to get outfitted in a complete set of gear for an incredibly low package price! Our friendly, knowledgeable Pro-Shop staff is happy to answer your questions both in store and on the phone. The Pro Shops at Sharks Ice offer a full line of Hockey Equipment for all ages and abilities. For Beginners we offer the least expensive skates and equipment, without jeopardizing quality or performance. Beginner Hockey Players are required to have skates, helmet, face cage, shin pads, elbow pads, gloves, protective supporter, stick and a roll of hockey tape to begin with. The purchasing of hockey pants, and shoulder pads would follow this. Other items eventually needed would be a garter belt, hockey socks, and a jersey. All equipment listed above is available at the arena Pro Shop at a 10% discount for Sharks Ice participants. Sharks Ice has a wide variety of Figure Skates, Dresses, Tights, and accessories for all levels of skaters. For the beginner we have Riedell skates in the $59-80 price range. For the intermediate and advanced skaters we carry Riedell and Jackson figure skates. We carry John Wilson, MK, and Ultima Figure Blades including Majestic, MK Professional, Gold Star, Gold Seal, and Legacy among others. We also stock Mondor Tights and Dresses, Chloe Noel, Bunga Pads and carry exclusively Zuca frames and Bags.